This item has been tested and approved by our guest blogger, Elizabeth Schulte Roth of Elizabeth Street, and her daughter, Caroline. "No Southern girl's wardrobe is complete without a set of pearls. These are simply gorgeouspracticing the piano never looked so glam!" 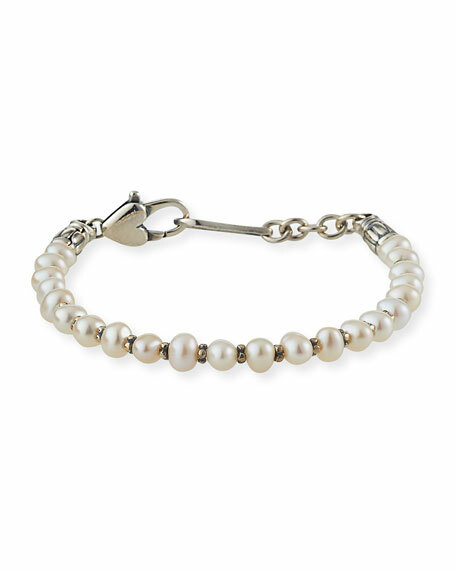 From the Kinder Collection, LAGOS crafted this pearl and sterling silver bracelet to add the perfect finishing touch to your little princess' look. Sterling silver signature lobster clasp. Armenta bracelet from the Old World Midnight Collection. Woven gunmetal-color pull cord. Naturally colored Tahitian cultured pearls. Blackened sterling silver rondelles with bezel-set champagne diamonds. 0.22 total diamond carat weight. Adjustable size; approx. 2–3.8"D. Slip-on style. Made in the USA. Konstantino bracelet in intricately carved sterling silver with 18-karat gold floral detailing. Open frame with naturally white cultured pearl cabochon ends. Hinged back eases slip-on style. Handcrafted in Greece.